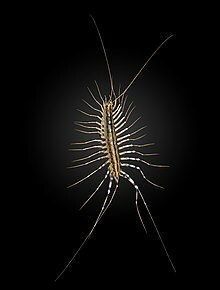 An Scutigera coleoptrata in uska species han Chilopoda nga syahan ginhulagway ni Linnaeus hadton 1758. An Scutigera coleoptrata in nahilalakip ha genus nga Scutigera, ngan familia nga Scutigeridae. Waray hini subspecies nga nakalista. ↑ Leach W.E. (1817) The zoological miscellany, being the descriptions of new ar interesting animals. III. XII. The caracters of the genera of the class Myriopoda., Taylor, London. 3: 31-45, 10 pl. ↑ Fabricius C. (1781) Species insectorum exhibentes eorum differentias specificas synonimya auctorum loca natalia metamorphosin adiectis observationibus descritionibus, C.E. Bohnii, Hamburgi & Kilonii. 1: VIII+552 pp. ↑ Latzel R. (1880) Die Myriopoden der Österreichisch-Ungarischen Monarchie, Fischer, Wien. 1: XV+228 pp. ↑ Scopoli J.A. (1763) Entomologia carniolica exhibens insecta Carnioliae indigena et distributa in ordines genera species varietates. Methodo linneana, Ioannis Thomae Trattner, Vindobonae . XXXIV + 421 pp. ↑ Geoffroy E.L. (1764) Histoire abrégèe des insectes dans laquelle ces animaux sont rangés suivant un órdre méthodique., Durand, Paris. Tome II, 690 pp. ↑ Lamarck J.-B. (1801) Système des animaux sans vertebres, Paris, Deterville. VIII + 432 pp. ↑ Linnaeus C. (1758) Systema naturae. Editio Decima., Holmiae. 1: 824 pp. ↑ 26.0 26.1 Bisby F.A., Roskov Y.R., Orrell T.M., Nicolson D., Paglinawan L.E., Bailly N., Kirk P.M., Bourgoin T., Baillargeon G., Ouvrard D. (red.) (2011). "Species 2000 & ITIS Catalogue of Life: 2011 Annual Checklist.". Species 2000: Reading, UK. Ginkuhà 24 september 2012. Ini nga pakli kataposan nga ginliwat dida han 22:09, 20 Hulyo 2013.